With its oversize volumes coming in at several pounds each, this guide to conifers truly has earned the modifier "comprehensive." With more than 5,000 photographs taken specifically for the publication, all 615 species of conifers are covered, with an additional 8,000 cultivars thrown in for good measure. Auders, a conifer collector and photographer, and Spicer, chairman of the British Conifer Society, recognizing that conifers are much more than a simple arrangement of needles on branches, have also included spectacular images of conifer pollen cones and seed cones, showing fully the amazing variety and beauty that is found in this huge grouping of plants of the subclasses Pinidae, Ginkgoidae, Cycadidae, and Gnetidae. Entries are neatly arranged with descriptions that include origins and dates; the authors also take the useful further step of including major nurseries and conifer collectors who can be relied upon to supply many of the plants contained within. VERDICT Such a detailed work comprised of such beautiful photographs would normally be prohibitively expensive, yet the cost is well within the affordable realm for most libraries. Both home gardeners who value the scientifically accurate and detailed as well as horticultural professionals would truly benefit from this up-to-date and comprehensive labor of love, which will be worth acquiring. Those who teach botanical courses within higher education could also find this extremely useful. One of the most memorable days in my horticultural career took place in the RHS Horticultural Halls in Vincent Square, London, in October 1970. The occasion was the Third International Conifer Conference. As Curator of the Hillier Arboretum I was one of those chosen to assist in the staging of a huge and impressive display of conifer species, varieties and cultivars, consisting of plants in containers and cut material, much of it in cone. Contributions had been made by some of the most prestigious collections, including nurseries in Britain and Ireland. Hillier Nurseries alone provided more than 1,000 different kinds and I can clearly recall the buzz and bustle in the hall as the many exhibits were assembled and labelled. Hillier’s had long been a rich commercial source of conifers for gardens and parks. During the 1960s and 1970s the popularity of dwarf and slow-growing conifers had reached a peak due in part to their increasing use as companion plants to heathers and other dwarf shrubs. This coincided with an increase in the number of smaller gardens available. Those were heady days for conifer enthusiasts and the Hillier Arboretum had by then established a large collection. It attracted some of the best-known European and American authorities on the subject. Over the years I was privileged to meet many of these enthusiasts as well as the many British experts such as Alan Mitchell, Bill Archer, Reginald Corley and Humphrey Welch. The last was owner of the Pygmy Pinetum who in 1966 published his first book Dwarf Conifers. Indeed, I remember taking him round the Hillier Arboretum collections when he was researching the book, a signed copy of which is in my library. Next to it is a copy of the classic Dwarf and Slow Growing Conifers by Murray Hornibrook, published in 1923. The latter was given to me by Douglas Bunce, one-time manager of the famous Red Lodge Nursery, at Chilworth, Southampton, where many excellent dwarf conifers such as Chamaecyparis lawsoniana ‘Aurea Densa’, C. lawsoniana ‘Minima Aurea’, C. obtusa ‘Caespitosa’ and Thuja plicata ‘Stoneham Gold’ were raised. The Hillier Arboretum collection contained many conifer cultivars of Hillier’s own raising or naming, including Chamaecyparis lawsoniana ‘Hillieri’, Cephalotaxus fortunei ‘Prostrate Spreader’, Pinus sylvestris ‘Edwin Hillier’ and Taxodium distichum ‘Hursley Park’, "Juniperus Chinensis". Pinus parviflora ‘Adcock’s Dwarf’ and Tsuga heterophylla ‘Lauresen’s Column’ were discovered by Hillier staff, and we must not forget Harold (later Sir Harold) Hillier, himself a respected authority on woody plants including conifers. In fact, Harold had authored in 1964 his own book, Dwarf Conifers, with an additional chapter on propagation by Edward Kemp, curator of the Royal Botanic Garden Edinburgh. One of the concerns among gardeners and nurserymen at that time was the rapidly increasing numbers of newly named conifer cultivars, especially dwarf and slow-growing forms. The worry was that there would be great difficulty in telling them apart, especially if labels or records were lost. As so often is the case in these circumstances, knowledge tends to be concentrated in the minds of a diminishing number of specialists with practical experience and good memories. 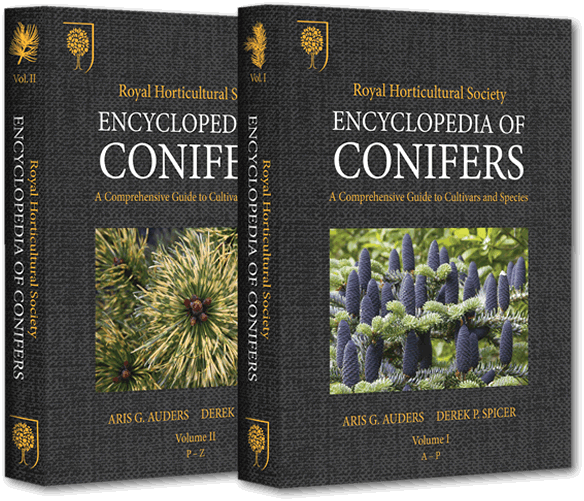 An increasing number of books, some well illustrated, designed to help gardeners, especially beginners, choose conifers most suitable for their gardens have helped relieve the situation over the years. Technical handbooks giving details, descriptions and background information of interest to the more serious collectors have also continued to appear. But still, the identification of conifer cultivars and their correct nomenclature can be a minefield to the uninitiated, and sometimes even the experts are uncertain. In the 1990s, changing fashions in gardening and the public perception of conifers as being stolid and less exciting than flowering plants caused a decline in their popularity, in Britain certainly. Also, the negative media publicity given to conifers, triggered by the planting of large conifers such as Leyland cypress in inappropriate situations, did not help the situation. Thankfully, there are signs that conifers are, at last, making a comeback. A new generation of gardeners is discovering their rich variety of foliage effect, texture and color as well as their myriad shapes and possibilities. Anyone who has admired the nobility or resilience of conifers in the wild, or their all-year-round qualities when grown alone or in association with others of their kind, will perhaps come to understand and exploit their potential as ornamentals in their own gardens. Those of us who never stopped enjoying and promoting them will rejoice in their re-emergence in the public conscience. How timely then is the publication of this impressive account. The authors are committed and knowledgeable conifer enthusiasts who have been supported by a wealth of international expertise and experience. Its coverage of conifers, both species and cultivars, hardy and tropical, is truly global. Covering all 615 species plus 8,000 cultivars demonstrates the ambitious and herculean task the publishing team set themselves when early discussions turned to action. It is of great credit to all concerned that the present work in two volumes is at last unveiled. It is claimed to be the most comprehensive account of its kind, which I do not doubt. Apart from its extensive descriptive text it is illustrated by a wealth of photographs, more than 5,000, which have been taken specially for this encyclopedia. As a conifer enthusiast of over 50 years standing, and an admirer of them in gardens and the wild, I welcome this account with open arms and a hastily arranged space, close to hand, on my favorite bookshelf. Its authors and their helpers have delivered a truly monumental account of a major group of woody plants which, in one form or another deserve to be grown in gardens large or small wherever life and hope for the future are cherished.